Martin Modern condo is an upcoming residential unit in the heart of Singapore, grand District 9. Claimed as one of the most exquisite areas of Singapore, District 9 offers serene surroundings with Orchard, Somerset, and River Valley grounds for a leisurely life. Build and developed by GuocoLand, Martin Modern will be one of the best condos in Singapore. Despite being located in the center of the city, Martin Modern offer you a peaceful environment to live. 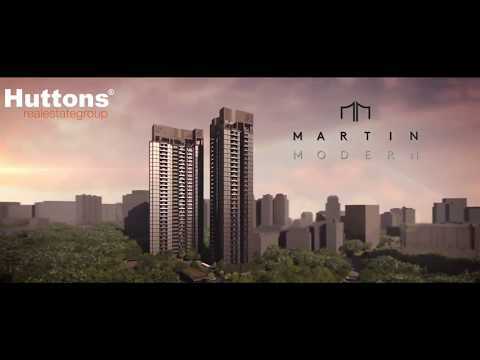 Martin Modern will have 450 units in two, 30-storey residential towers. These units will offer different floor plans including 2 bedrooms, 2 bedrooms & study, 3 bedrooms, 3 bedroom premium & 4 bedroom layout. Planned to meet high standards of living, Martin Modern extends a variety of facilities and services to its buyers. Over 80% of the land area in Martin Modern will be turned into a Botanic Garden, where one can relax amid nature. This botanic garden is said to have over 200 different species of plants and 50 varieties of palms and other trees. It will also have a swimming pool, pool spa, tennis court, clubhouse, deck as well as a state-of-art gym and a well-equipped BBQ facility. Why must you buy Martin Modern? There are countless reasons that ensure you must buy a condo in Martin Modern. One of the prime reasons is the Developer. Martin Modern is a project handled by Hong Leong Group, GuocoLand, who are renowned to deliver premium quality residential facilities by using modern construction techniques and expert architecture knowledge. Secondly, as mentioned earlier in the post, Martin Modern is set to be launched in the best urban residential area of Singapore, District 9. Thirdly, it has a myriad of facilities to offer. You get everything at your disposal in Martin Modern including spa, swimming pool, gym and a BBQ facility to have small gatherings with family and friends. Fourth, it is a well-planned condo unit with all necessary options in the close vicinity. It is just one stop away from Orchard and three stops away from the CBD and has many shopping malls close by. Two major arterial expressways like Ayer Rajah Expressway (AYE) and Central Expressway (CTE) will offer the residents of Martin Modern best connectivity with the rest of the island. There are also renowned primary schools and international schools nearby including River Valley Primary School, Chatsworth International School, Singapore Management University, Overseas Family School and Anglo-Chinese Junior School. Last but equally important, the condos have latest interior designs and thus offer you a chance to explore the Urban living. The condos are available at an affordable price. If you are willing to explore the luxurious way of living, there is no better option than Martin Modern to buy.